Harbor City, Los Angeles, California, U.S.
Brian Philip Welch (born June 19, 1970), better known by the stage name Head, is an American musician, singer and songwriter best known as one of the guitarists and co-founder of the nu metal band Korn and his solo project Love and Death. Along with fellow Korn guitarist James "Munky" Shaffer, Welch helped develop Korn's distinctive sound, a mix of sirenlike shards of dissonant guitar that mimicked a turntablist's various effects and rumbling down-tuned riffing, that defined the nu metal aesthetic beginning in the mid-'90s. "You travel, you get to another town, you play a show and you do it again. You try to just be at peace but even a big, huge band like Korn, playing in front of thousands of people, it can get lonely. You feel like you're a trucker and you're traveling with a bunch of truckers. You can't connect with people except for the ones that you're with because the ones you party with after the show, you don't know them and then you're gone. When everyone's drunk, you're like 'Alright. Later.'" "They heard that I'd written it, and there was rumors going around in Hollywood that I was totally trashing them and that it was a "tell all" book about everything they did and I did. And so they actually wrote two songs on their new album bashing me about the book. But once I heard that they were concerned about the book, I sent them a copy and put a note in there and said, "I love you guys. I didn't trash you like people say. Read it yourselves. It is what it is." And now they're doing interviews, and I've read that they're totally cool with the book, and it's not what they thought it was going to be. So everyone's happy. But, now they've got two songs hating on me on their record. But it's cool. It's all good. I love them, they love me. I think maybe I deserved those songs because of some of the stuff that I said after I quit the band. So it's all good." "Brian actually contacted us recently and wanted to come back to the band. And it was not the right time... for us. We're doing well, and it's kind of like... It's kind of like if you divorced your wife and she went on and she stayed successful and her career flourished, and you go back and [say], "My gosh, she's still hot. Baby, can we get back together?" "Wait a minute... All the stuff's been divided, and it's like..." I don't see it happening right now." "I recently learned of an interview that Munky gave where he said that I came to Korn and asked to be taken back in the band. That's definitely not a complete and accurate picture. The full truth is that for about a year... Korn's managers have been requesting my manager to work on getting me back into Korn. The calls were initiated by Korn's managers, not my manager. I shut the door on their requests many, many times over the last several months." "As far as Munky's comment that "everything has been divided already" that is also not accurate. In fact, from January 2005 when I left, and for the next 4 years, Korn failed to pay to me royalties that were due me on records that I did with them. However, I don't believe this was done intentionally. We are trying to be patient and work with their management to get the financial issues resolved so that "everything can be divided as we agreed long ago in our contracts." On May 5, 2012 at the Carolina Rebellion in Rockingham, NC, Welch was there originally as a special guest for a performance by Red. Later that evening, Korn was performing on the main stage and Jonathan Davis brought out Welch as a special guest to close their act, marking the first time Welch had performed with Korn since his departure in 2005. Welch performed with the band at Rock on the Range in May 2013, as well as Rock Am Ring and Rock Im Park in June 2013 in Germany, as well as Download Festival in England. Welch rejoined Korn permanently on May 2, 2013 and recorded his first album with the band in ten years, The Paradigm Shift. 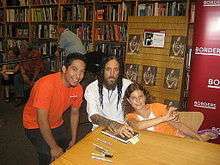 Brian Welch (middle) signing his autobiography Save Me From Myself (2007). Along with many other artists, including ex-Korn bandmates Fieldy & Munky, Welch contributed to "A Song for Chi". The instrumental track was to benefit Deftones bassist Chi Cheng, who was in a coma but later died. All the profits benefited the "One Love for Chi" foundation. This was the first time Head was involved with any of his former bandmates since leaving the band. 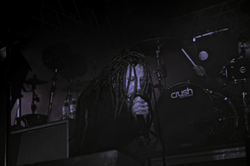 Despite rejoining Korn permanently in 2013, Welch has elaborated that Love and Death will remain an active project. On May 17, 2016 Love and Death released a new single, "Lo Lamento", as a free-download with the purchase of his book, With My Eyes Wide Open: Miracles & Mistakes On My Way Back to KoRn. 1 2 Ruhlmann, William. "Brian Welch – Artist Biography". AllMusic. All Media Network. Retrieved 19 December 2015. ↑ Heaney, Gregory. "Love and Death – Between Here & Lost". AllMusic. All Media Network. Retrieved 19 December 2015. 1 2 3 4 5 6 "Highs and Lows - Entertainment / Neon - ReviewJournal.com". Lvrj.com. September 1, 2009. Retrieved June 8, 2011. ↑ Brandon Geist (May 8, 2012). "Exclusive Photos: Korn with Founding Guitarist Head". Retrieved May 6, 2013. ↑ "Guitar World's "100 Greatest Metal Guitarists of All Time" – Blogcritics Music". Blogcritics.org. Retrieved June 8, 2011. ↑ "Former Korn guitarist follows new path of spirituality". Greatfallstribune.com. Retrieved June 8, 2011. ↑ "Audio Lounge – Live Radio Streaming, Internet Radio, Audio Downloads & Podcasting". Hope 103.2. Retrieved June 8, 2011. ↑ "The Full Armor of God Broadcast". Podcast.fullarmorradio.com. January 16, 2009. Retrieved June 8, 2011. ↑ "Valley Bible Fellowship / Welcome / Welcome To Vbf". Vbf.org. Retrieved June 8, 2011. ↑ Interview by Dena Ross. "Former Korn guitarist Brian 'Head' Welch talks to Beliefnet about leaving the rock star life after finding becoming a Christian. –". Beliefnet.com. Retrieved June 8, 2011. ↑ "Headbanger's blog podcast". Headbangersblog.mtv.com. Retrieved 2015-04-16. ↑ "I Am Second: Josh Hamilton and Brian "Head" Welch. " Modern March | church theology culture". Modernmarch.com. December 20, 2008. Archived from the original on July 14, 2011. Retrieved June 8, 2011. ↑ Archived January 9, 2010, at the Wayback Machine. ↑ "Ex-KORN Guitarist HEAD Allegedly Asks To Come Back to the Band, Gets Denied". Roadrunnerrecords.com. Retrieved June 8, 2011. ↑ "Myspace". Blogs.myspace.com. April 21, 2011. Retrieved June 8, 2011. ↑ "Message: Brian 'Head' Welch Interview". redrockschurch.com. June 2011. ↑ "Brian 'Head' Welch Dishes on New Music, Fatherhood + His Relationship With Korn". Loudwire.com. Retrieved December 10, 2011. ↑ "Brian 'Head' Welch Joins Korn Onstage at Carolina Rebellion". Loudwire.com. Retrieved May 5, 2012. ↑ "Brian 'Head' Welch Rejoining Korn 2012". noisecreep.com. Retrieved November 20, 2012. ↑ "Upcoming EU and US Festivals with Brian "Head" Welch". korn.com. Retrieved February 21, 2013. ↑ "Korn Enter the Studio for New Album – Video". Rolling Stone. Retrieved May 2, 2013. ↑ James Montgomery. Brian 'Head' Welch Aims To Save 50 Cent, reported by MTV News March 2005. Retrieved July 9, 2007. 1 2 James Montgomery. Brian 'Head' Welch Hopes Solo Music Will Fund Skate Parks, reported by MTV News March 2005. Retrieved July 9, 2007. ↑ James Montgomery. Brian 'Head' Welch Explains Why He Left Korn, reported by MTV News February 2005. Retrieved July 9, 2007. ↑ "Ex-KORN Guitarist BRIAN 'HEAD' WELCH: 'Flush' Video Available". Roadrunnerrecords.com. Retrieved 2015-04-16. 1 2 3 "Former Korn guitarist follows new path of spirituality | Great Falls Tribune". greatfallstribune.com. Retrieved June 8, 2011. ↑ "Independent Music Awards". Independent Music Awards. Retrieved June 8, 2011. ↑ Archived June 26, 2009, at the Wayback Machine. ↑ "Top40-Charts.com". Top40-Charts.com. Retrieved June 8, 2011. ↑ "Brian Welch - Chart history". Billboard.com. Retrieved 2015-04-16. ↑ Smith, Debra (Spring 2011). Price, Tom, ed. "The Whosoevers – Bringing Youth to Christ". Calvary Chapel Magazine. Calvary Chapel Magazine. 47: 36–43. 1 2 3 "Brian "Head" Welch starts new album | HM". Hmmagazine.com. September 9, 2008. Retrieved June 8, 2011. ↑ "headfreaks.com". headfreaks.com. Retrieved June 8, 2011. ↑ "BRIAN "HEAD" WELCH | Gratis muziek, tourneedata, foto's, video's". Myspace.com. Retrieved June 8, 2011. ↑ "Over My Head Spring Tour – we need your help!". App.e2ma.net. Retrieved June 8, 2011. ↑ "email : Webview". App.e2ma.net. Retrieved December 10, 2011. ↑ "iTunes – Music – Paralyzed – Single by Brian "Head" Welch". Itunes.apple.com. October 4, 2011. Retrieved December 10, 2011. ↑ "Brian "Head" Welch – Watch Paralyzed Video". Facebook. Retrieved December 10, 2011. ↑ "BLABBERMOUTH.NET – Former KORN Guitarist Launches LOVE AND DEATH". Roadrunnerrecords.com. Retrieved November 20, 2012. 1 2 3 4 JAMIE ROSS . "Courthouse News Service Entertainment, Securities & Environmental Law". Entlawdigest.com. Retrieved June 8, 2011. 1 2 "Brian Head Welch Changes Band Name – The Gauntlet News". Thegauntlet.com. February 7, 2012. Retrieved November 20, 2012. ↑ Casey (November 6, 2012). "Tooth & Nail | News | Love and Death's "Between Here & Lost" Now Available January 22nd!". Toothandnail.com. Retrieved November 20, 2012. ↑ Tom Leu (2016-05-21). "INTERVIEW: Brian "Head" Welch". RockRevolt Magazine™. ↑ "Korn Equipment List". Angelfire.com. Retrieved June 8, 2011. ↑ "Equipment for Korn". Members.tripod.com. Retrieved June 8, 2011. ↑ Coward, Anonymous. "Gearwire – Custom Ibanez Baritone: A New Guitar For A New Album With Korn's Brian "Head" Welch". Gearwire.com. Archived from the original on September 28, 2011. Retrieved June 8, 2011. 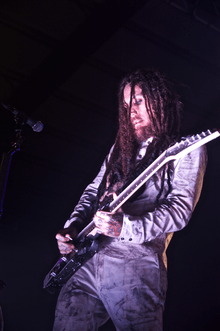 ↑ "Ultimate Guitar – Brian Welch: 'I Was Completely Out Of Energy Before I Found Christ'". Ultimate-guitar.com. Retrieved June 8, 2011.